Janis Martin Interview with Bruce Duffie . . . . . . .
Janis Martin (born 16 August 1939) is an American opera singer who sang leading roles first as a mezzo-soprano and later as a soprano in opera houses throughout Europe and the United States. She was born in Sacramento, California and studied at California State University-Sacramento and the University of California-Berkeley. She began studying singing in Sacramento with Julia Monroe and later studied in New York with Lili Wexberg and Otto Gruth. 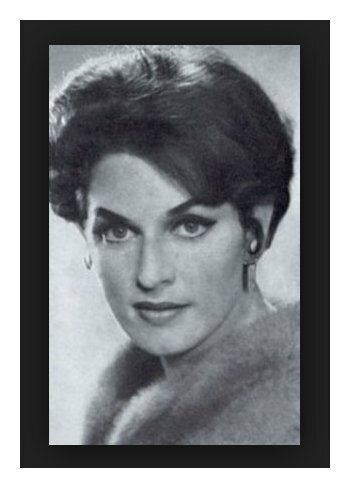 She made her operatic debut in 1960 at San Francisco Opera as Theresa in La sonnambula, and at 21 was the youngest member of the company that season. She continued to sing a number of comprimario mezzo-soprano roles with the company through 1969, including Sister Anne in the 1961 world premiere of Norman Dello Joio's opera Blood Moon. [Names which are links refer to my interviews elsewhere on my website.] 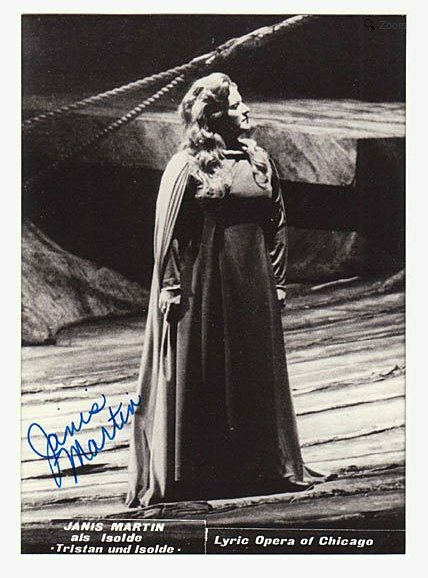 She returned as a soprano in 1970 in the title role of Tosca and appeared there regularly though 1990, when she sang the role of Brünnhilde in Die Walküre, Siegfried, and Götterdämmerung for the company's complete performance of Wagner's Ring Cycle. On 23 March 1962 she had won the National Finals of Metropolitan Opera National Council Auditions singing "Mon cœur s'ouvre à ta voix" from Samson et Dalila, and later that week made her New York City Opera debut as Mrs. Grose in The Turn of the Screw. Her Metropolitan Opera debut came on 19 December 1962 when she sang Flora Bervoix in La traviata with Anna Moffo as Violetta. She went on to sing 147 performances at the Met between 1962 and 1997, first in mezzo-soprano roles, including Singer in the 1964 US premiere of Menotti's The Last Savage and from 1973 leading soprano roles including Kundry in Parsifal, Marie in Wozzeck, Senta in Der Fliegende Holländer, and the title role in Tosca. 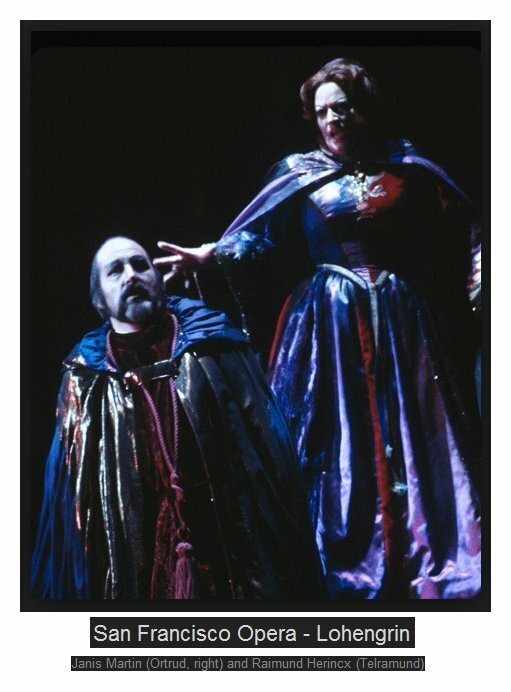 Her final appearance with the company was in 1997 when she sang Brünnhilde in Die Walküre with Plácido Domingo as Siegmund and Deborah Voigt as Sieglinde. Martin sang with the Deutsche Oper Berlin from 1971 to 1988 and at the Bayreuth Festival from 1968 to 1973, also in 1989, and 1995-1997. She retired from the stage in 2000 to live in Nevada County, California, where she gives singing lessons and occasional recitals and concerts. 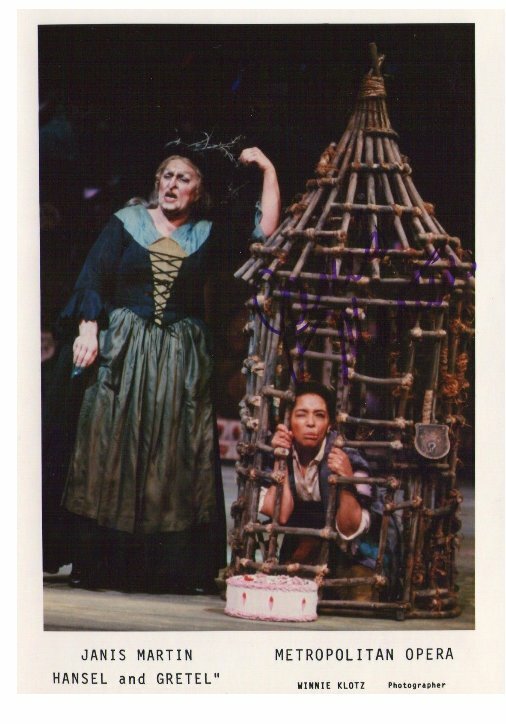 Janis Martin visited in Chicago in six seasons -- five at Lyric Opera (as seen in the box below) and in May of 1976 at Orchestra Hall for The Flying Dutchman with the Chicago Symphony conducted by Sir Georg Solti. The cast included Norman Bailey, René Kollo, Martti Talvela, and Werner Krenn, and the concert-version was presented both here and at Carnegie Hall, and then recorded. Janis Martin: Thank goodness I remember my parts! Bruce Duffie: Do you use a prompter? JM: Sometimes, but sometimes the prompter doesn't know just what you want when you look down to him. He should give everything all the time. BD: [Surprised] Don't they speak all the lines regularly? JM: Some do and some don't. Some think they're bothering you by giving you your text, but if all of a sudden you need it and they are just then deciding not to give it to you, that's when you need it -- and it's too late by the time you've looked down and they've looked down and found the line. Sometimes you do use them because you're not a machine and you can have a blackout, and you don't want to have it go on forever, or sometimes you might twist a word around, or get the next sentence one sentence too early and it wouldn't work out with the music. BD: Do you sing your roles in more than one language? JM: There's one opera that I've done in three languages and I'm going to probably do it in my fourth -- Bluebeard's Castle, which I did here in Chicago in 1970. That I've done in English, German, and Italian, and now Maestro Bartoletti wants me to do it in Florence for the Maggio Musicale in Hungarian. I told him I would if I have time to come for four days rehearsals for the staging, and he said he wanted me on any condition. So I'll try to work it out. I'm very busy at that time, and then to learn it in Hungarian... Right now I could learn it very easily because there are a lot of Hungarians around this area. BD: This station where you are right now has a Hungarian-language program, and the guy has been doing it for forty years! [With a gentle nudge] Solti is in town right now, so you could go to him! JM: [Laughs] Oh yes, I'm sure he has a lot of spare time to do that for me! JM: I've also done it on a ramp where there were not the doors, but each time a light would come on along the ramp. That was enough in a small theater. Then I did a crazy staging in Frankfurt with Dohnanyi conducting and Ingvar Wixell was my partner. It was on a double bill with Schoenberg's Erwartung. I did not do the Schoenberg -- I had not done it yet, but I've done it lots and lots of times since then. But in Frankfurt, the director had me start out on a carousel horse and the wind was blowing through my hair. I had a white dress with lights all over it, and each light had a little battery. Later I was in a field and corn was blowing back and forth. It was just nutty, but sometimes those kinds of things are fun to do. BD: Do you like all this imaginative staging? JM: It depends on what you are singing. I wouldn't want to sing my vocally most taxing roles doing those gymnastics, no. BD: In Bluebeard, there are just the two characters onstage for the whole hour. JM: Yes, it can be kind of boring if you don't have two strong people. You have to know exactly all the time what you're gong to do. JM: ...it would be shattering, yes. BD: Let's get back to Wagner. Do you sing your Wagner roles in one or another translation? BD: Would you, if you were asked? JM: Probably not. In the early part of my career I did sing a Venus in English, and vowed then and there never to do anything of Wagner in English again. BD: You don't think it works? JM: It probably works for the audience, but it doesn't work for me. I don't like it. BD: If you were in the audience would you enjoy it more? JM: I don't suppose so because I speak German so fluently, but if I were an American and did not understasnd German it would be nice to understand the words. But translations are usually quite archaic. You can't understand them anyway, and if you do you laugh. BD: Of course Andrew Porter's translation of the Ring is superb. I saw and heard that in Seattle. There they did it one week in the original German and the following week in the English translation. Noel Tyl mentioned to me about having a memory lapse in English cycle. JM: I can understand that. All of a sudden you don't know which language to sing it in. You know what you want to say, especially if you're fluent in both languages. It's criminal to make someone do that -- to go back and forth. They should do it all in one or the other. However, in Ariadne, quite often in America the Prologue is done in English and the opera is in German. I used to sing the Composer, and it's easier to sing in German, but I think the audience appreciated having it in English. JM: And too bad if the singer is on the floor with her face behind all those words! In the Manon Lescaut on the TV from the Met recently, I noticed they were on the ground a lot in the last act and the words were passing all over their faces. BD: How about singing two different roles in a single opera? JM: Oh my, I've done lots of roles in lots of operas. 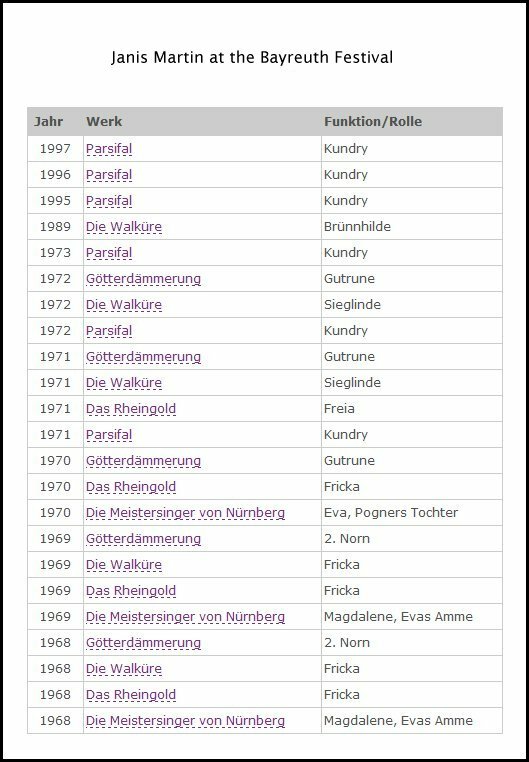 This is my 20th anniversary year in opera. I started so very young and I began in little tiny parts in San Francisco. I studied there for two years in the Merola training program but was too young to be in a contest they had out there. I was 18 and 19 and you had to be 21, but Mr. Adler said that I was very talented and should come and study there. I learned my first scenes and saw all the rehearsals -- chorus and orchestra, everything. BD: Is this good experience for a young singer to witness these rehearsals? JM: It was for me. I was eating it all up. I'd never seen an opera before. I had quickly learned 3 arias to sing for Mr. Adler. I'd only been studying voice for 3 months when I auditioned for him. I guess I was a "natural" at that time. I auditioned for him and then trained with him for two years, and had a standing room pass to the operas. In the mean time I was going to the University of California at Berkley. Then I got my contract for the following season when I jumped in for a girl who had won the auditions. It was in a television program. She was in two scenes and I was in two others. I was singing mezzo at that time, and she got sick the morning of the program. I had learned all of her things, so I did Suzuki and Maddalena and Martha in Faust and part of the title role of Carmen. It was funny. I was changing from my Japanese eyes, and to long hair back and forth between the old grey wig and the regular one. Mr. Adler was announcing the program and was calling off-stage, "Janis are you ready? Can we go on?" At the end he was very pleased with the way I had handled everything and kept my nerves, and offered me a contract for the following season. That was in 1960 and I got very tiny parts. I was an orphan in Rosenkavalier, and the next season I sang Annina. Then in Germany I sang Octavian and now I sing the Marschallin, so I really know Resenkavalier by now! BD: Suppose you were asked to do a recording of Rosenkavalier and sing all the parts that fit your voice. Would you do some kind of stunt like that? JM: I don't think my voice would be suited for Sophie ever, but it would all sound the same, wouldn't it? Your voice sounds the same whenever you sing even when you are a different character. You could try to color it but everybody'd say, "It's her, I can tell!" BD: Talking of many roles, you've sung Venus, but have you ever done Elisabeth? JM: I've sung Venus many many times. It was the first part I ever sang in Germany. I've sung Elisabeth in concert and I'll sing it next year in Germany. BD: Would you do both on the same evening? JM: It can be done but there's no reason to do it. You can say that it's the different sides of the character, but you don't have to do it. It can be that was in Tannhäuser's imagination that it's the two sides of the woman he likes, but it doesn't have to be the very same person. BD: Then you get into Wagner's imagination. JM: Well, nobody can ask him any more! He had a wild imagination, I must say; some of the stories, and his twists of the various legends such as the Ring that he put into it himself. BD: What parts do you sing in the Ring? JM: I used to sing Fricka in both operas, but I never did the Götterdämmerung Waltraute. I've sung two separate Walküren, and Fricka and Sieglinde, so that's four parts in that opera. In Rheingold I used to sing Fricka and now I do Freia -- not everywhere, just in my home theater, the Deutsche Oper in West Berlin. In Siegfried I don't sing anything and in Götterdämmerung I used to do a Norn, which is very interesting. I like those parts; they've very short, very important, and you're through at the beginning of the opera. Now I sing Gutrune and I'm there the whole evening and I don't have a bit more to sing. Probably it won't be too long because everybody's been asking me for years and years, but I'm starting to get ready to do Brünnhilde. I will be doing my first Isolde in Zurich in January, and that leads into that direction. But I've always said that as long as I'm singing Sieglinde I don't want to do Brünnhilde because nobody will ask to me to Sieglinde any more, and that happens to be my very best part of any part I sing. Everybody tells me they think that's the best thing I've ever sung. BD: It was a very satisfying portrayal here. JM: I feel very engaged in that opera. I do in most of the parts I sing, unless it's a part I really can't identify with, and I end up eventually dropping those roles. BD: You're to the point in your career now when you can say "no"? JM: I've said "no" for years. I've always been able to say "no" because I've kept my cool and I've never been so ambitious that I've taken things that I felt were too much for me. BD: Is it hard to say "no"? JM: Oh, of course it is because you know if it goes well it might make the difference as to whether you make a world career or not. I decided that I would like to take the middle way -- take the big houses and take the parts I'm offered that I want to do, and if they offer me things that I don't want to do then I don't do them. Maybe people get angry if you say "no", but that's too bad because if I feel it's not a part for me then I don't do it. It takes a lot more strength than to say "yes" all the time. I think that my voice is much fresher at my age than a lot of others singers who were much more ambitious. I would not say I'm not ambitious but I just think about it a little more. BD: You've paced your career in such a way as to not burn yourself out. Is this the kind of advice you'd give to a young singer? JM: It depends on the temperament. I know I had a lot of temperament, and if I had gone right into the repertory I sing now I would have probably sung myself out because I would not have been able to control my self at a young age. If you can keep cool about it, it is alright, but if you're too cool then you don't make it very interesting... and you don't make it either. If you're cool on stage, that's the bad part. If you're cool when you're thinking about it and looking at your calendar and being realistic, that's necessary; knowing that there I'm going to have this much time to rehearse, and I'll have that much time to get used to the time-change from the jet-lag, and then there will be that many days for a new role, that many days to feel comfortable with it, who's the conductor going to be, who's my partner going to be, etc. There are certain stage directors who are so taxing that you come crawling out for the first performance, so I try not to work with them too much. BD: Do you prefer doing new productions and premieres as opposed to a set show? JM: It depends on how much time I have. If it's a big new production in an important house, then you take the time for it. I don't like to work with people who upset me and have ideas that go against my convictions. I'm rather traditional. I like new ideas and I am very excited to be able to talk to a stage director about them, but I don't like to be forced to do things that I feel are absolutely wrong. BD: Have you pulled out of a production in the middle of rehearsals because of disagreements? JM: Not in the middle, but one time it was very close to the beginning. I must say I'm rather consequential and I'm not hard to get along with, but I don't accept everything that is thrown at me. There are some things that are incredible that you can't say yes to if you have any character. BD: Tell us a little about the characters you've portrayed. You're doing Ortrud here in Chicago. Will you eventually do Elsa? JM: I don't think so because I don't think anybody's going to think of me as Elsa. I have rather a light-colored voice for Ortrud, but I don't believe Ortrud's a mezzo. I never have believed it. Astrid Varnay was probably the best Ortrud that ever lived, and she was never a mezzo. Ortrud needs such a strong high voice, and there are only a couple of places in a couple of ensembles where it's low. The rest of it is very declamatory and very high. BD: Do you find it easy to be menacing? JM: Well, I'm such a nice person really... Actually, it's funny. The people who are the nicest find it easier to be menacing on stage than some people who are really conniving and terrible. I guess maybe they don't want to show their true character. Ortrud is not a very nice lady, but she's convinced that she's right in what she's doing. BD: Is she the power rather than Telramund? JM: Actually I think Telramund is rather in the hands of Ortrud. She puts the things in his mind to make him think, "Oh yes, I must do this and that." He is continually looking to Ortrud, "Am I doing this right?" He relies on her to give him advice, and when she gives advice to fight against Lohengrin and he loses, he says, "It's all your fault. You told me to do this." But then I tell him also to plant this idea in Elsa's mind to ask Lohengrin his name and where he comes from. I do it myself, too. So he's a little bit of a puppet, or a marionette under Ortrud's power. She's more of a force then he is. He has to be strong on stage, but he is the weaker of the two. I don't think he really realizes just how bad she is. BD: How would you feel if, at the end of a performance, the audience was hissing and booing for the two of you? JM: I would not take that as a compliment, but when we are getting into position before the curtain rises, the chorus will start to hiss and we have a big laugh before we get going. BD: Are you distracted by extraneous things before or during a performance? JM: I try to detach myself completely from anything personal while I'm on stage, starting from just before I step on stage. Five minutes before you go on, you need to blank out anything else because you need a tremendous amount of concentration onstage. I find it terribly distracting to have things like noises from the wings and flies, or doors opening backstage so you hear the faint sounds of others away from the performance. In Berlin the stage hands have little walkie-talkies and you can sometimes hear that, or hear some feedback from there. Things like that jolt me -- nobody else notices it, but it irritates me tremendously, because it breaks my concentration. It makes me angry that people are not more considerate of the performance that's going on, since that's the most important thing happening in the house that night. BD: Does the conductor waving his baton bother you? JM: Well, he's part of the performance, but I don't always look! One night there was a man in the first row, right to the side of the conductor, and he was reading his program with a little flashlight! This annoyed me a lot. I wanted to stop the performance and tell him to put it out! It was driving me crazy! BD: Vickers scolded the audience once. JM: Well, I'm not Vickers, and I didn't want to distract the whole audience. If I am distracted, I would not want the whole audience distracted. I love Jon, but I don't understand how he could do that, and I could not do that myself. BD: How much do you rely on the conductor? JM: Everything has to stay together, that's for sure. He's not a machine and some nights he's a little faster or slower. It can be a problem if he doesn't catch it right away when you want to go faster because he happens to be slower that night, or because you have phlegm in your throat or have to swallow one more time or are a little short of breath or whatever. BD: Do you find the good conductors are singing with you? JM: Yes! The very best are. There are a lot of good conductors who are not always concentrating on the singers because they feel they can rely on certain people. They feel they can let them go and concentrate on the orchestra, and I happen to be one of those people they sort of let go. I don't have really low performances. If I don't feel well, then I cancel, and that is one thing I've always done... unless there's no other way for the theater to get somebody else at the last minute, if you get sick at the last minute. BD: So there are no times when the manager comes out to announce your indisposition? JM: There was one time I had a cold and thought it was over. I had taken some strong medicine and the doctor said I could go on, and I did, but during the second act my voice kept getting smaller and smaller. The conductor said he didn't notice a thing, but I said somebody should go out and make an announcement before the last act. If I don't make it through the last act, it's too late after it's over to say anything. I did sort of scrape though, but it was not the kind of performance I like to give. It was Meistersinger, and the most important things that Eva sings are in the last act. You just die up there if you're not feeling well, and my vocal cords were swelling and I couldn't do anything about it. I had to keep taking more breaths because my air was escaping. BD: Did that break up the line? JM: Well, if you're as experienced as I am you can fool a lot of people. I don't like to fool them, but if you're in trouble you have to sometimes. BD: Those are the times you rely heavily on technique. JM: You must or you might hurt your throat, and that's your capitol, your whole life, your career. You must not damage your vocal cords. BD: I've been at performances where they announce an indisposition and the singer sounds glorious. BD: Of course you have the long break because you do not sing in the second act. JM: Yes, but that's exactly when your voice can drop. If you keep going and keep singing and singing, it might drop at the end of the performance. But if you sing the first act and then it drops before you have the third act to do, it's too late to stop before the trio and say you're not feeling well. So I had an announcement made, but I thought that second performance was better than the first one, so you never know. JM: We have a little system in our house. My husband reads them, and if they're good he shows them to me. If they're not, he doesn't say anything about them. I want to read them anyway, but not before the second performance because you find yourself being influenced by them. You're a little bit excited and roughed up a bit before the performance to read something that may not be even true, but it may make you wonder about something you've done and there's no time to really think about it. So I don't read them just before a performance, I read them sometime when I can be objective about them. I must say I haven't had a bad critic for years [knocks on the wooden table]. I joked about it the other day saying the good reviews go in an album and the bad ones go in the wastebasket. It's just one person's opinion, and everybody has a different opinion -- even the critics. They have their problems, too. They might have been working hard all day, or eaten too much or not eaten anything, or just had a fight with their wives or whatever. BD: Do you like singing the long parts? You're into Wagner and these are the very long and arduous parts. Do you like these as well as shorter ones? JM: It's a hard question to answer. I don't like them because they're long, they happen to be long and I happen to love some of those parts. I would prefer to have some shorter parts, and I'm hoping maybe in the future to have a few that are shorter because at the moment all of mine are just killers. There are none where I can go in and say, "Tonight I have an easy evening." One of my easiest evenings would be a hard one for anyone else. In my theater in Berlin, they asked if I wouldn't like to have an easy evening and do the mother in Hansel and Gretel. Actually, I'd rather do the witch ... [laughs] My son would love it. BD: Do you like all the parts that you sing? Are you sympathetic with the characters, or are there some that lie well for the voice but you don't like the character? JM: I do not like Venus, and I've done Venus probably more than any other single part in my repertory. It is not written very sympathetically for the character, and consequently for the person singing it. She should be seductive and she has no chance at all to be seductive -- at least in the Dresden version. BD: Do you prefer the Paris version? JM: I did that first, and they still do that version in Vienna -- an old Von Karajan staging of it with terribly old costumes and wigs. It's probably one of the few places outside of Paris that they do that version. The Parisians feel it's their version. That version is longer but easier for me. It's more singable, more seductive, so you can understand how he was there in the first place. In the Dresden version, the minute she opens her mouth she's screaming at him all the time, being sort of nasty to him all the time. BD: But you convey this nastiness? JM: I do, but if someone asks me if I like the part I cannot honestly say that I like singing it. BD: Are there roles that you want to sing that are not in your voice? JM: I suppose some of the Italian, Verdi roles. I never really thought about roles that are not for my voice. I'm not an Aïda, I'm not a Traviata. I would like to sing Manon Lescaut and have not done it yet. I would also like to sing Santuzza. In Europe that's done a lot by a soprano. It needs a good middle and lower range, which I have from the days I was a mezzo. I need that for Ariadne and Sieglinde and other parts in the soprano repertoire. BD: How did you arrive at the decision to go from mezzo roles to soprano roles? JM: My voice made a gradual change as I matured. When I went to Germany I was 26 years old and I had not yet sung a big part. That's the reason I went there. I went to Nuremberg to get my repertory, and through singing Amneris, Eboli, Dorabella, the Composer, Octavian, and Cherubino I found that I was the best in the high parts. One of my best parts used to be Eboli, although some of it was too low for me. In all the parts where most of the mezzos would die because of the high range, that's where I would shine. The Composer is very high, and Octavian is not very low, and people and critics were writing that perhaps I was becoming a soprano -- which in fact, I was. It was a gradual, natural thing. I didn't just decide; it happened to me. BD: There are some mezzos today who are trying to push their voices up to soprano. JM: I don't know whey they don't just try to be what they are. BD: Because they want to sing Tosca? JM: Tosca is a fantastic part, I must say, but you can't push yourself into something you're not. Eventually you pay for it. You have to find out what you can sing and what you can't. BD: This is the patience that you have which is all too rare. JM: I don't know if it's patience. I certainly try things out before I say that I'm going to do them. BD: When you approach a new role, what steps to you take? JM: I get the score and I look at the music and at the words. I look at the type of character and the kind of singing that's going to have to be done, and the range -- whether there is a lot of piano in the high portions. That's why I would not do Aïda, because although I have a good high voice, I don't have the kind of voice that can keep singing piano with great relaxation in the top. That takes more lyricism, and I have a more dramatic voice. I think the parts I sing suit me physically and vocally. There are a few roles that would suit me very well -- I could sing Octavian perfectly well -- but nobody's going to engage me to sing them, so why would I try to sing them? I must be realistic about it. I'm smart enough to know that nobody's gong to think of me as that character. I would love to sing Desdemona, but nobody's going to engage me to sing that. People think of me in the Wagner/Strauss roles. In a way it's too bad, but in a way it's good because it's the roles I do sing the best. BD: What about making recordings of a few of those roles that you would not do on the stage? JM: As a matter of fact I did Adriano in Reinzi, and I would never, ever sing it on stage. I had a series of concerts in Berlin and Vienna and the house just went wild, but I wouldn't want to do a lot of fencing and protecting my girl friend. Being a knight in shining armor just doesn't suit me, although it's a beautiful part to sing. It's very taxing, very hard. BD: How did you approach Octavian, then, when you were singing it? You've got to be a young man. JM: I was a young woman, and it is written for a woman, so you don't really have to be a man. You're a young person. I was very arduous in a way that I could make it believable. I was quite slender than. Most people are surprised to see how short I am. I think big! I have a certain carriage and I do it on purpose. I know why I am doing it. I do try to wear comfortable high shoes to make myself look a little bit taller. JM: The only Berg opera I've ever done is Wozzeck. I wouldn't do Lulu. That wouldn't suit me, anyway. The only other new work I do is Erwartung of Schoenberg. That's 30 or 35 minutes of just one person, a monodrama. It's very taxing and very hard. When I first started I thought I would never ever get it learned right. It's just something that's incredible. BD: What if a young composer wants to write something for you and asks for advice? JM: I'd say to finish it first and let me see it. It would have to be someone who knew my voice while composing it. I wouldn't just say, "Oh fine, I'm thrilled." I would ask if he knew what I can and cannot do, and what I do the best and what I don't do the best. It would have to be someone who was writing it with me in mind, knowing what I can do and what I sound best doing. It wasn't written for me, but I was offered a part for a record in Milan recently while I was there doing Erwartung with Abbado at La Scala. I was shown the score, but I knew before I was saw it that I wasn't going to do it because I know what this composer writes like. It's been done, but never recorded. I looked at it and thought, "My God, how could anybody want to do that?" It had me humming a high C with the mouth closed and slowing opening the mouth. Maybe somebody will say yes to that, but it's not going to be me. BD: Are there any composers today who write in a style grateful to the voice? JM: Probably you're asking the wrong person because I don't know too much about it. In the time I was at the Met we were doing Vanessa. Barber, Britten and Menotti are the three that come to my mind that I think write beautifully for the voice. JM: Yes, at something that I don't have a part in or don't sing. Watching an opera that I have a part in, I can't sit still. Everybody does it differently. I know all the mistakes and I think, "Oh isn't that terrible," or "Oh, I wish I could do it like that." I'm a good audience if I have the nerves for it and have the time. I don't go to a log of opera, though. I go to other things. I like to go to musicals and the ballet and symphony concerts. BD: Would we find you at a disco? JM: No, it's too loud for me. I'm used to having the orchestra in front of me, but not that way. BD: Speaking of things in front of you, do you like working with a scrim? JM: It's good for the lighting but it's terrible for us. We can hardly see the conductor sometimes. In this Lohengrin in Chicago there are two scrims, and you feel like you're singing into a paper bag. BD: The overall impression comes across to the audience very well, however. JM: Oh I know it does. I'm not worried about it. It's good for certain lighting effects, but sometimes I wonder why they're using it because certain effects are not very effective. The visual effect is very important. BD: Are there times when you go to the director with an idea to try? JM: Only in things I'm doing myself. I don't give hints on how to stage the opera in any way. If he's told me to do something and I don't feel that it's right, or if I feel I can't do it yet, I ask him to explain it to me in another way and then I try it a couple of times. If I can't do it properly and with conviction, then I say to give me another day or two to work it out, or eventually ask him to do something else there. I ask if we could find another way to express the same thing. BD: What if you got a really good idea for another character? Would you ask the director to try it? JM: I'd probably talk to my colleague first and see if he thought it was a good idea. Sometimes you can offer the stage director something that works because the two characters have already gotten together on it. BD: Have there ever been directors who have left you too much on your own to come up with ideas for your character? JM: Absolutely. There was a problem at La Scala recently. Abbado, who was conducting Erwartung, wanted to do all the staging that Schoenberg had written into the score. There are only about ten things he wrote there, and it's usually when there is not very dramatic singing -- things to the side which are not very important to the action, actually. He wanted somebody to stage it, but the person did not want to do what was in the score, so it was up to me. Then they gave me a very unfortunate dress. It was by a very famous designer, and everybody was so impressed that I was going to get this beautiful dress from him. I thought it was just awful, and so did the critics. They said it was too bad that this dress was designed for this opera, and the poor lady sang so beautifully and had to wear this horrible thing. It distracted rather than helped. I saw that from the very beginning, but everybody was so impressed with the designer's name. I'm not impressed by that very much. So I had to do the staging myself. I asked for this and that, and the director gave me those two things on an empty stage. The rest of it was flat with nothing on it, with the projections that Schoenberg had used, and they just didn't work, that's all. I thought it was miserable, but the main thing was the music and we got that over. BD: Is that the way it is in opera -- that the main thing is the music? JM: In this case the main thing is the dramatic impact of the music and the dramatic impact of the one person, no matter what is surrounding her. If the personality of the one person in this work does not come through, you might just as well forget it because there's nothing left to it. Nobody can help you. BD: What about in a larger work like Meistersinger or some others? JM: Then there are lots of people, and each does his own thing and relies on the others to do theirs. Then they get together on it. BD: In a way I'm asking the "Capriccio" question -- is the music the servant of the words or vice versa? JM: I don't think you can separate them at all. BD: Do you enjoy doing recordings? JM: It depends on the conditions . If they're done too hastily without a chance to repeat things and do them well and be relaxed about them, then I don't enjoy it. The Rienzi was quite satisfying and I did enjoy it. We had lots of time for it, and that was nice. BD: I'm looking for your thoughts on the put-together perfect-performance that emerges on the plastic disc. BD: It has more soul? JM: It does. You just can't compare them. I'm much more for the live performance than for the recording. I think things should be recorded so you have them forever and you can listen to them at your leisure. Why shouldn't you have recordings as well as the live performances? I'm for both, but it's not so good to compare the two. BD: What about TV and films? JM: It can bring people closer to the opera -- especially those with subtitles -- and brings opera to people who might not ever have a chance to see an opera otherwise. I think it's good. BD: It should stand along side but not be a substitute? JM: Oh, hardly a substitute. BD: I want to ask you a bit about Isolde. You're just coming to this part, so tell us a little about the Irish princess. JM: She gets to use a lot of the things I've learned though many years of singing. She's very angry at the beginning with Tristan, and she gets to be ecstatic in the love duet and then sort of mystic and mythical at the very end. I can see myself using a lot of the experience I've had from many parts I've sung. I'll need a lot of the good middle range that I've had in the mezzo parts and a lot of the good high range and a lot of the experience I've had from singing Wagner. JM: Yes, as a matter of fact that was the last mezzo part I ever did, and I did it with Birgit Nilsson in 1969 or 70. BD: Will you wipe out the one part when you sing the other? BD: What about the end of Tristan? How do you see this transfiguration -- is it mystical? JM: It's not mystical, but it shows a person who has gone through the span of life in a very short time -- from the child she was at the beginning, she's the mature woman at the end who knows. She's sort of wise and all knowing. I've not done it yet so it is really too early to ask me. I'm right in the middle of studying it now. BD: Is it something you're really looking forward to? JM: Oh, very much. It's the longest part I've ever done in my whole life -- it's probably one of the longest in the repertory, and the most taxing, probably. BD: We've not touched on the Dutchman, which you sang here and recorded with the Chicago Symphony and Solti. Do you find that she goes through the same kind of thing as Isolde only in a shorter time span -- from the innocent to the mature? JM: No, I think Senta is a much different character. She's the dreamer. She's looking for someone she's not even sure was even real or that she would ever see. Isolde is dealing with a person she fell in love with. He killed her fiancée and sent her the fiancée's head, and she still fell in love with him. Tristan's really a pretty miserable character when you think about it. So she's dealing with a real person and Senta is dreaming about this picture and the story she's heard. BD: Is Senta really surprised when the Dutchman actually arrives? JM: I think deep down she knows he exists, but doesn't expect him to be standing in her doorway. BD: What would she have done if he had picked one of the other girls who were spinning? JM: [Laughs] That's a good question. I don't know! They're not so interested in him. They probably would have all run away. They all know the story, but there's a bond between those two electric poles. JM: I do that one all the time. Around Easter time I could do ten Kundrys in ten days if I'd let myself. Vienna, Munich and Berlin all do productions at the same time, and it's a part I've gotten so well known for that I get asked by everyone to do it. I never can say "yes" to everyone, so somebody's always angry and you can't help it. Sometimes I split myself between two, but not more. Last year I did Vienna and Berlin, and the previous year I did Munich and Berlin. It's just different each year. You can't do everything. BD: Tell us about Kundry. JM: She's fascinating. She's in a different state in the different acts. In the first act she's not being possessed by Klingsor; it's when he pulls her with his magnetism towards the end of the first act when she's going to sleep. She says she must sleep and asks that no on come near her. Then he takes possession of her, and all her actions toward trying to seduce Parsifal are under the influence of Klingsor. It's not what she wants to be; it's what she has to be. BD: Is it her mind that is under his power or her soul? JM: I don't know... Can you separate your mind and soul in an opera character? It's hard to say. She must do it for whatever reason. She's compelled to do it; he makes her do it. She doesn't want to do it. She wants to be good. She says to Gurnemanz, "I never can be good. I'm terrible. Don't thank me for anything." She doesn't want anybody to be nice to her because she feels terrible. She feels guilty although she doesn't know what she's done. BD: Is it almost like a hypnotic state? JM: Yes. Then at the beginning of the second act with Klingsor she's miserable, absolutely miserable. She's trying to fight him off and he's stronger than she is. Then he takes possession of her and wins her over, and she starts laughing and becomes hysterical. BD: How does the laugh and the scream affect the voice? JM: I've learned how to do them without hurting myself at all. The first time I thought I was going to strangle myself. You have to support it like a high G and let your voice come down like a waterfall -- at least that's how I do it. You must never just scream. You have to support like mad, otherwise you could hurt yourself. BD: Do you enjoy the third act where you only sing a couple of words? JM: Very much. It is the most rewarding thing, although you must get calmed down and quiet enough to do that third act. It's simply an acting part. It's just beautiful and I just love it. BD: Now you're looking toward Brünnhilde? BD: Would you be able to do just one and not the other two? JM: That's the thing. Once you start doing one, then everybody what you to do all of them. BD: Would you be happy doing just one of them? JM: I would like to do the Walküre, but most people think of me in Götterdämmerung. Siegfried is the shortest but probably the hardest. You have the whole day not knowing what to do with yourself because you have a hard performance, but it's so very late that evening and the tenor is nearly dead by that time. People think she's got it easy but she doesn't. She has to come in there and be fresh and not worried, and that's hard. BD: Do matinee performances bother you? JM: I draw the curtains and pretend it's later. The voice is different at that time of day; our bodies are geared for eveing work. We're used to getting up late and having something to eat, and then exercising or resting and then going to a performance. BD: What about going from one side of the world to the other? JM: I try, now, not to sing immediately after I get somewhere. When I went to Japan last February, I stopped over in Anchorage first for two days to break up the trip, and then went on to Tokyo. Then I was there about a whole week before I sang. I gave myself the luxury of having a whole week before and a week after so that I could get used to the time change, then have my rehearsals, then the concert, then a week after for myself to enjoy seeing a little of Japan. It's not every day you can go to Japan. BD: Is going from East to West easier than going from West to East? JM: It depends on whether you've just packed your suitcase and rushed off with hardly any sleep or not both ways. Sometimes you're a victim and other times you can plan a little bit better. BD: I trust you enjoy singing! JM: Oh I do. I must admit that. It's a great part of my life. I love sports and I love to swim, but my family and my singing are the most important things to me in my life. Sometimes it's very hard to co-ordinate the two, especially travelling around. I have a little boy who will be seven in two days. We live in Germany. He was born there and is being brought up bi-cultural and bi-lingual. He goes to the John F. Kennedy Schule, a German-American school. BD: So how do you bring your youngster to opera? JM: In our case it's quite interesting. My husband started a boys choir thirty-three years ago in West Berlin, in the ruins of the city. He had gone to the musik hochschule and studied instruments. He wanted to do something, but after the war what was he going to do? He took little boys from the street, with the patches sewn on their trousers and their shirts, and had them sing for the grandmothers and the wounded. In the years they have made many recordings and gone all over the world and been to the World's Fair and on TV. They are the Schöneberger Sängerknaben [named after the District of Schöneberg in Berlin]. They have also sung at the Deutsche Oper in many operas that need children. These days he has children of the first group of boys! That's quite an accomplishment to have started that out in those times without any government support and continue for all these years. Anyway, they sing in Hansel and Gretel, and that was the first thing my son saw at the opera. He went backstage afterword and saw where the angels had been kneeling down and the tree that Hansel and Gretel went to sleep under. He was fascinated by it all. He doesn't like to go to rehearsals; he just likes to see the finished product. He hasn't gotten that far that he wants to see the repetition. But I can't take him to all the things I'm in. They're too long, or I'm killing somebody, or they're killing me, or I'm jumping off somewhere. In the Flying Dutchman I kill myself in the end, and in Tosca I kill the baritone and then kill myself and the tenor gets shot. He's still a little young for that when it's Mommy, but he is getting so he can take it in other works. There are lots of theater mothers, but I'm not too ambitious about forcing my child into that. BD: If he goes in that direction, will you encourage him? JM: I would rather hope that he does not want to become a singer. Unless you become someone very, very famous, it's a very difficult job for a man. You can land at the very bottom or not very much above it, eating your heart out because you didn't make it. If you don't have something to fall back on it's a miserable profession. If you make it to some degree and you're satisfied with what you've done, then it's OK, but what can a singer do if you can't get a job and can't sing? You're not prepared for anything else. It's too young for my son yet, but he's said he wants to be a veterinarian and an astronaut, so who knows what he will be? But I would like to have him trained to do something that's useful and needed at the time that he's going to be grown up. BD: If nothing else, he will be a good audience! BD: But despite the difficulties, you enjoy your own career! JM: Very much! You know what I hope never happens to me is that I sing just for money. I like to make a good salary because I have to live, but I never want to go on the stage having the feeling that this is a job. It's a performance for me every time I step on the stage no matter where I am. It's an experience for me and I hope it is for the audience. I don't know what will happen when I get too old to sing these parts, but I'm not too worried about that. BD: Might you then sing smaller character parts? JM: Someone I admire is Martha Mödl, and she's done that. I don't know whether it's out of necessity or if she just would collapse if she didn't sing. BD: There seems to be a German tradition of leading singers doing small roles as they get older. This brings their huge experience to the younger colleagues. Paul Schöffler did that as I recall. JM: It depends what kind of singer you are. Martha Mödl can do that because there are interesting parts for her, but for someone who has sung soubrette all their life, what can an old soubrette sing? There just aren't any parts for an old soubrette. Astrid Varnay is another who has done some interesting parts later on. That might be what happens to me because I tend to go for the interesting parts anyway. I love the interesting characters. I do Marie in Wozzeck because she's an interesting and complex character. She's heartwarm and tragic. She wonderful. Tosca has everything a woman would want from a part -- glamour and love and hate and violence. I can see why people would want to give up everything else just to sing Tosca. I suppose I'm able to be more grateful to be an opera singer now that I'm a little bit older. When you are a beginner you're just more anxious to get going and get your career on its feet. When I left the Met I was still singing small parts, and I made up my mind I wanted to sing big parts. This is how much I think about things before I do them. When I went to Germany, I secretly said to myself -- I don't think I ever said it in words -- if I don't make it at least to some degree within two years, then I am going to give up completely and do something else. By the time I'd been there for three months, I'd already sung Venus in the Paris Version of Tannhäuser in Paris! I was under contract to a smaller theater, but I guested in Paris. I also sang Venus at La Scala. I'm grateful to have sung it because it's taken me so many different places, but I still don't have to say I like it. BD: Thank you so very much for taking the time to speak with me. This conversation was recorded in the studios of WNIB, Chicago, on October 16, 1980. Portions were broadcast on WNIB in 1989, 1994 and 1999. The transcription was made and much of it was published in Wagner News in April, 1981, and in Opera Scene in October, 1982. It was re-edited and the complete interview was posted on this website in 2014.